PTA Versus Physical Therapist: What’s the Difference? Physical therapists play a critical role in the lives of their clients, but the effect that physical therapist assistants have is no less critical. In fact, PTAs enjoy rich, rewarding careers filled with opportunities to have a significant impact on countless individuals. If you’re looking to enter physical therapy, there may come a time when you mull whether or not to become a PT or a PTA. 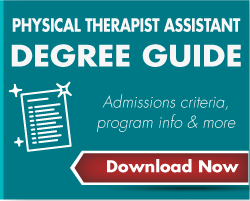 Your initial thought might be to go to the PT route from the start, but many students, once they compare the two programs, find that becoming a physical therapist assistant is the preferred path. Today, we offer up a comparison of PTA versus physical therapist, highlighting the benefits of each career path and the key differences between the two. Although both jobs exist in the world of physical therapy, you might be surprised by certain aspects of each career. One of the biggest differences lies in the amount of schooling that one goes through to make it into their field of choice. For physical therapist assistants, you’re looking at two years of school to attain your Associate’s degree, the minimum and preferred entry requirement. During that two years, you’ll learn about the different types of therapies that exist, including deep tissue massage, mobility development, pain management, modality use and more. You’ll put these into practice with your fellow classmates, volunteers and in a clinical environment to hone your skills in therapy, patient interaction and communication. Physical therapists face a much lengthier process to attain their degrees. You’ll need to first earn your Bachelor’s degree, which will take four years in most cases, and once that’s complete, you’ll move on to an approximately three year Doctoral degree in Physical Therapy. When studying to become a PT, you’ll learn a lot more about theory, diagnosis and optimal treatment options in addition to the procedural mechanics that PTAs learn. The schooling is different in both subject and length. You’ll be in school a lot longer to earn your Doctorate, seven or eight years compared to two, but the breadth of what you learn will be larger as well. It’s to be expected that becoming a Physical Therapist, which requires a Doctorate, will leave you with a higher salary than if you were a PTA, but the gulf between the two may not be as wide as you think. According to the Bureau of Labor Statistics (BLS), the median wage for Physical Therapist Assistants in May 2015 was $55,170. That’s pretty impressive for a two year Associate degree. For Physical Therapists, that number jumps to $84,020. Both degrees are in high demand. The BLS reports a 41% jump in employment between 2014 and 2024 for PTAs, with 34% growth in the same timespan for PTs. Clearly, these are two industries where the demand for skilled workers is there. It’s far easier and less competitive to get into a PTA program than it is to get into a Physical Therapy program. PTA positions aren’t as well-known as their PT counterparts. Many people don’t realize this field exists or don’t give it the consideration it deserves until they’ve done extensive research into Physical Therapy. Getting into PTA school is therefore much easier to get into than PT school, which is a notoriously difficult nut to crack given the fierce competitiveness, requirements and the incredibly strict limits that colleges place on the number of students they can take per class. PTA programs have the added benefit of not requiring a Bachelor’s degree prior to entry. Many people, fully intending to become a Physical Therapist, start by getting their Bachelor’s degree, which means they apply for PT school their senior year of college or shortly thereafter. Unfortunately, what often happens is these people don’t get in to PT school and are left with a Bachelor’s degree that doesn’t get them the job they really want. If you enter a PTA program, you don’t have to worry about first attaining a Bachelor’s degree that may or may not lead to another degree. You can get your Associate degree right out of high school and be ready to enter the field at the age of 20 having not spent four years on a degree you won’t need. It’s something to consider when choosing between PTA and PT. PTAs interact regularly with clients. They’re the ones who work with them through different exercises and therapy techniques, learning about their personal lives and speaking to them about the challenges they face but will be able to overcome. It takes a special kind of individual to be a PTA, someone who can talk freely with just about everyone and really listen when clients express their hopes, frustrations and doubts. That compassion component is critical for PTAs to put into practice on a daily basis while following the plan of care prescribed by the Physical Therapist. As a PT, you’ll be the one who consults with clients and determines the appropriate course of action for each person. You’ll need to carefully assess the situation and lay out best options for each individual as well as create short and long term goals for each patient. While a PT will speak with a client near the start of the process and check in at certain key points to monitor progress, patient interaction time is actually far below that of a PTA. You’re more likely to analyze data, study charts and reports from the PTA and fill out assorted paperwork. As the one who runs a clinic and the different processes within it, it’s up to you to handle billing, insurance and other administrative duties. If working with people is what drives you to this industry, then PTA might be your best choice. You may not be making all the decisions about therapy, but you will often be the one putting that therapy into practice. You’ll also have a much shorter stint in higher education, able to enter your field within just a few short years. PTs, on the other hand, trade a longer time in school, including much heftier student loans, for a higher salary, and getting into that school is tougher. You will be entrusted with making decisions regarding optimal therapy for patients and running a clinic that conforms to modern healthcare best practices. You act as a manager, with all the attendant benefits that typically confers. Only you know what choice is right for you. Hopefully you’ve found this guide helpful. We wish you the best of luck determining where your future lies in the world of Physical Therapy.